Community gardens are a relatively recent innovation. And when you consider the changes that have occurred in the country over the last century, one can readily see why that should be. By way of example, in 1921 over half of British Columbia's population lived in a rural area. Today, only 14% of the population lives in a rural area (1). While in years past the majority of people would have had access to large outdoor areas for vegetable gardening, that is no longer so: with apartment buildings and condominiums being ever increasingly popular housing choices, people's ability to garden is increasingly limited. If you should be one of the many who do not have a backyard amenable to growing vegetables, you should be aware that most cities now have community gardens. A community garden is a common plot of land worked by multiple people; most commonly each gardener works their own plot within the garden. And it can be more than what you think: some gardens have been carved out of waste areas, and in the densest cities. even built on highrise rooftops. The town of Stratford, PE (population 8,574) built our first community garden this spring. Funded by the town of Stratford, the Walmart Evergreen Fund and the Stratford Area Watershed Improvement Group, an open sunny area across from Cotton Park was transformed into a garden. At the beginning of June, ground was broken and slightly raised plots varying from 6'x12' all the way up to 10'x40' laid out. Bark mulch for the walkways, raised taps and hoses for watering, and a parking lot, and the garden is all set to go. And go it has - vegetables and flowers have sprung up throughout, including large plots planted for the local Food Bank. 4) enjoy fresh mixed greens all winter! After putting the cold frame into the ground, the next step is germinating seed. Although the cold frame helps to ameliorate the freezing temperatures of winter, it isn't a heated greenhouse - careful thought has to be given as to the choice of greens to overwinter. Some plants are more cold tolerant than others - mache and kale are far more tolerate of cold than tomatoes and watermelon - and even within a species, certain varieties may be particularly well-suited to cold-weather culture. Given the increased interest in all season gardening, there are many gardening companies that are beginning to respond to customer demand by providing more cold-tolerate vegetable varieties. With the help of the internet and some postage stamps, everyone can have access to an almost unlimited selection of heirloom, traditional and modern veggies. For this experiment, my winter green will be various cultivars of lettuce. Lettuce is easy to grow, versatile to use, and many varieties ideal for winter cropping can be found. Started from seed a few months before the cold sets in, lettuce is transplanted into the cold frames to grow. The lettuce makes its gains during the day, and if frost threatens overnight, the cold frames can be closed. Once the temperature has dropped below freezing during the day and the daylight hours have shortened considerably, the lettuce will stop growing, but the plants can be preserved - as though within a refrigerator crisper - in the cold frames all winter. I have chosen three varieties of leaf lettuce, two varieties of butterhead lettuce and probably the finest winter gardening romaine available. The seeds come from Hawthorne Farms, a Palmerston, ON company that is new to me. (I love the old-fashioned feel to the brown paper seed packets and the wood-cut style printing.) Because lettuce germinates best at relatively cool temperatures (21-24 C), the best approach is not sowing it directly in the cold frames in summer - the seed would languish in our hot sun. Instead, I germinate it in the basement under grow lights, where the ambient temperature hovers right around the ideal. Remember to label your plantings - it's incredibly easy to lose track of what you've put where! The first step towards a winter garden and - hopefully! - a winter harvest is the construction of a permanent, in-ground cold frame. But what is a cold frame? A cold frame is an enclosure with a transparent lid which serves as a season extender for growing hardier plants. There are many different types of season extenders, from very simple things like cold frames built out of bales of hay to elaborate constructions, such as greenhouses. In this case, my cold frame is built from wood, insulated with rigid blue foam, and partially buried in the ground (which further helps to ameliorate heat loss). It has no source of heat, other than capturing solar energy behind the twin wall polycarbonate lid. This is in contrast to a close relative, the hot bed, which is a similar structure save for the fact it is heated (for example, by heating tapes buried in the ground). This is the basic construction of the cold frame. Note that it slopes downward back to front to present a greater surface area to the low winter sun. It measures approximately 4 feet wide, 8 feet long and varies from 8-12" deep. While building it out of naturally rot resistant wood (for example black locust or cedar) ensures it will last, this is likely going to be difficult to source; this cold frame is simple pine. We'll see how long it survives in the humid, wet environment of this tiny Atlantic island. Resist the temptation of chemically preserved wood. Siting the cold frame is very important. Avoid low-lying areas where cold air may pool. Facing the south in full sun, if available, is best - one needs to take every advantage of the thin winter sun. If you're lucky enough to be able to place it at the foundation of your house or another heated building without sacrificing sunlight, the heat from the building will help to keep the cold frame warm; otherwise, placing it in the lee of a windbreak (fence or line of trees) will improve heat retention. Finally, since the cold frame is partially buried, remember that whatever site you choose you will need to be able to dig it down into the ground. While this is not particularly difficult in PEI, it may be quite a bit more difficult in other Atlantic locales where the ground is rocky and hard. You will need to be able to dig a hole large enough to accommodate the cold frame such that the top of the front edge is flush with the ground around it. The lid of the cold frame is composed of a wooden frame set with a 4x4' sheet of twinwall polycarbonate. This material is light, strong and thermally insulating; it lets the sunlight into the cold frame to warm the air within, and keep the plants inside from freezing solid. 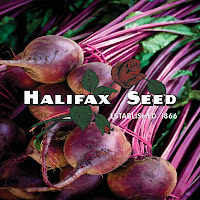 In my region, it is available for order from the Halifax Seed Company. The final step is the use of a thermal energy storage device. Sounds impressive, but it's really just a 10 litre plastic container of water placed inside the cold frame. To aid in capturing heat, the side of the plastic container facing south is painted black. During the day, the sunlight warms the water in the container, and at night the water releases the stored heat back into the cold frame. I picked up these containers at the local supermarket, where they are sold as water to store in case of emergencies, spray-painted one side black, and will line the back of the cold frame with them. One might think that the first step in growing vegetables from seed would be planting the seeds. Or maybe ordering the seeds. But as many gardeners know, one often has too much fun ordering seeds, and it's necessary to store some for use the next season. So the first step may be pulling out previous years' seeds from storage and wondering how well they have weathered the process. Fortunately, vegetable seeds do store well. My method involves an air-tight container (I use a plastic bin designed for storing dog food) and a desiccant (pictured above). The desiccant came from Lee Valley, but probably can be obtained from any hardware store. If you don't have too many seeds to store, glass jars with tight-fitting lids (e.g. pickle jars, etc.) work well. Seeds are best kept in a cool, dry place. If you have room in your fridge, a temperature around 5 C is ideal. I don't keep my seeds in the fridge (I'd need another fridge!) but I do keep them in the basement cold room, which maintains a temperature of 5-10 C year round. I store the seeds in their original packages, grouped by year of purchase, in the airtight container along with the desiccant. The desiccant is great stuff - it keeps the humidity within the sealed container low by gradually absorbing the moisture out of the air. Indicator crystals / panels which are part of the product start out blue and turn pink as the silica crystals become saturated with water. Once the desiccant loses its drying power, it can be recharged by baking it in the oven. Ambitious but geographically limited gardeners (such as the trail blazer Eliot Coleman) have been pushing the boundaries of off-season gardening for decades. But I have to admit it - when I first heard tell of gardening in winter, it sounded entirely ridiculous to me. Winter is a substantial season here on Prince Edward Island. There's a lot of snow. I own snowshoes! Snow shoes are not an affectation around here! But more recently all-season gardening has been gaining popularity even here in the Canadian Maritimes. 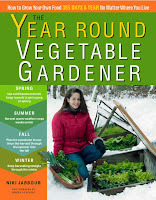 In her book "The Year Round Vegetable Gardener", near-Haligonian Nikki Jabbour makes it seem plausible - even straight-forward. But can it really be done? Really? The winter weather here can be brutal - snow, rain, freeze-thaw-and-freeze-again, salt and snow! snow! snow! But Niki's optimism (and the photographs of all that lovely photosynthesis amid the snow) is inspirational - and so I'm going to see whether I can duplicate her success in Halifax, NS (average temperature in January / February of -5 C) here in Charlottetown, PE (where the average temperature in January and February is -8 C). By the numbers, success is not assured. The difference between -5 C and -8 C doesn't sound like much, but even a few degrees prolonged over months can amount to lot of stress to over-wintering plants. But Charlottetown isn't out of the running yet - we have several advantages over Halifax, including our abundant snow (which acts as a great insulator and tends to ameliorate the effect of killing freeze-thaw cycles) and our famed iron-rich red Island snow, which is a big improvement over Halifax's poor top soil thinly laid over granite. Although PEI does suffer under the burden of an enormous variety of voracious slugs, unlike Halifax we do not have to guard our gardens against deer. Although the hour grows late (according to Niki, I should have started seeding at the beginning of July), a mild autumn is predicted for the Island, and it may forgive my tardiness. 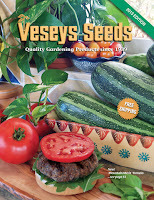 I grow heirloom vegetables from seed, including many heirloom varieties. Enjoy the photos of the these strange - often downright ugly - vegetables. Could these be veggies only a mother could love, or do they taste better than they look? I'll let you know! I've also been I've been experimenting with winter gardening, inspired by the success of other maritimers. Can you really garden 365 days a year in PEI? We'll see . . . .